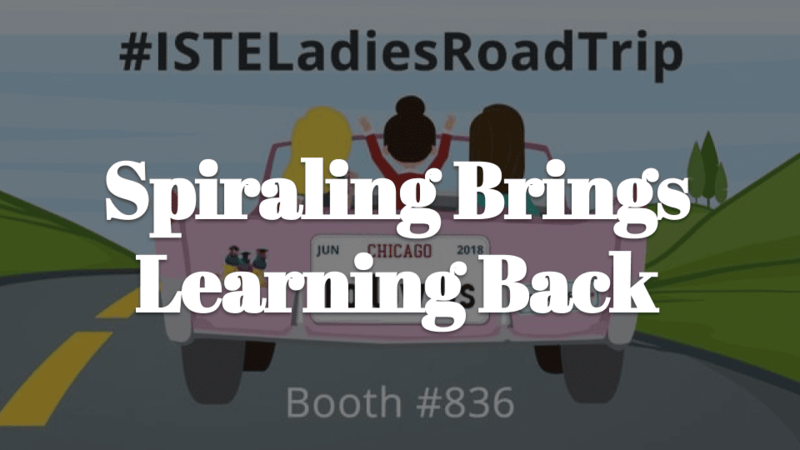 On the ISTE Ladies Road Trip myself, Lisa Dabbs, Christine Pinto, and Sarah Kerns stopped off at different schools sharing tips with teachers on integrating technology. However, learning is not about technology. It’s how the technology allows for us to better implement pedagogy. It is much more effective to keep coming back to a topic rather than do one and done. Spiraling says to keep coming back to a topic, and preferably to go a little deeper each time. There are many EdTech tools you can use to help students keep coming back to a topic. I use Quia.com/web because it has a question bank and I can choose to have it pick a random 5 questions. 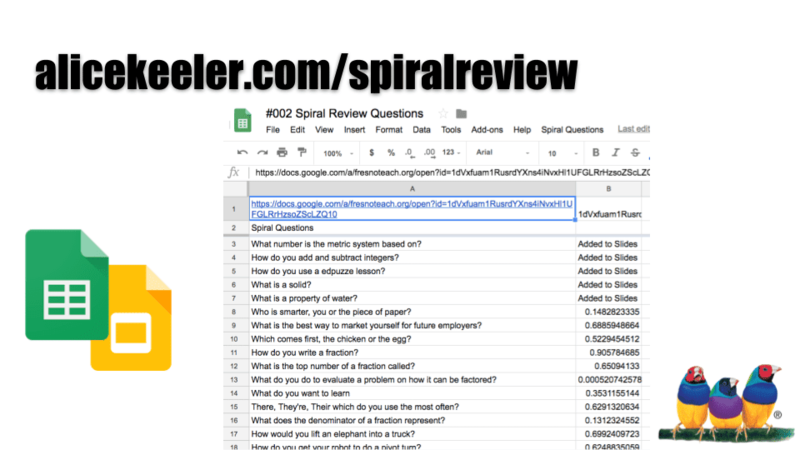 Since the answer is always a spreadsheet, you can create a list of questions you want to spiral back to. At the end of each day, what is one or two questions you want to ask again later? Add it to the spreadsheet. Of course, the question is… how do you push those questions out to your audience? Using my template, random questions are chosen from your spreadsheet list and pushed to a Google Slides. Every 30 minutes, the slides CHANGE! 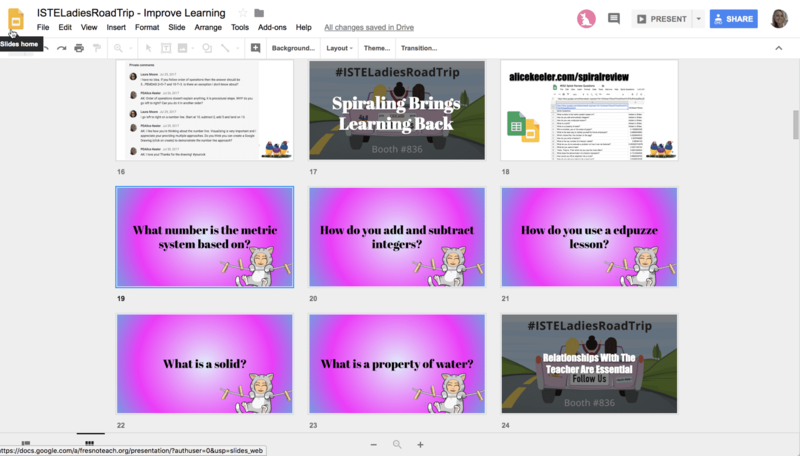 This allows you to simply press PRESENT in the Google Slides and have 5 questions ready to spiral back to. This is my first experience with blogs and I must say, I love your blog! So many great ideas. I have been searching for ways to add spiraling into my classroom as my students often forget things learned in the beginning of the year. Your idea is perfect. Most options I found did not allow me to write my own problems, they simply followed the Common Core Curriculum. I just finished setting up some questions using your spiraling templet, your directions were excellent. My school just started with Google Classroom this year and I am not real familiar with Google Slides. I have a few questions that I am hoping you can help me with. First, I noticed a Q&A option in the presentation mode. Do you use that option too? Also, I was wondering if this slide show could be connected to Google Classroom, so the students could work on it at home as well. I look forward to hearing from you.